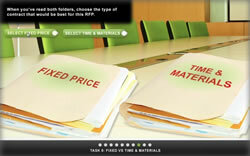 Learners compete against two team on 10 challenging, real-world tasks to win their chosen RFP. It’s a jungle out there. An urban jungle. And this game on how to win proposals helps tame it. Ten challenging, real-world tasks are unlocked by the learner one at a time as they compete against two teams on their race to win their chosen RFP. Each challenge is set in a different environment to maintain engagement: a college campus, a baseball stadium, even a pizza parlor!